In Egypt, women launched their own press since1892, at a time when lots of women rights were highly debatable, their right to a voice was loud and clear and quite popular it seems. A fact that puts women's status in Egypt in a whole new perspective. The magazine included general information, entertainment, and short stories, but what is outstanding is that it was the only woman magazine that focused on animal rights at that time. in its article Victims of Women, it describes how women "sacrificed beautiful birds for nothing more than hat decorations. In England alone, 25 million birds are killed for that purpose." The magazine also objected the use of animals to test new drugs and medicine. 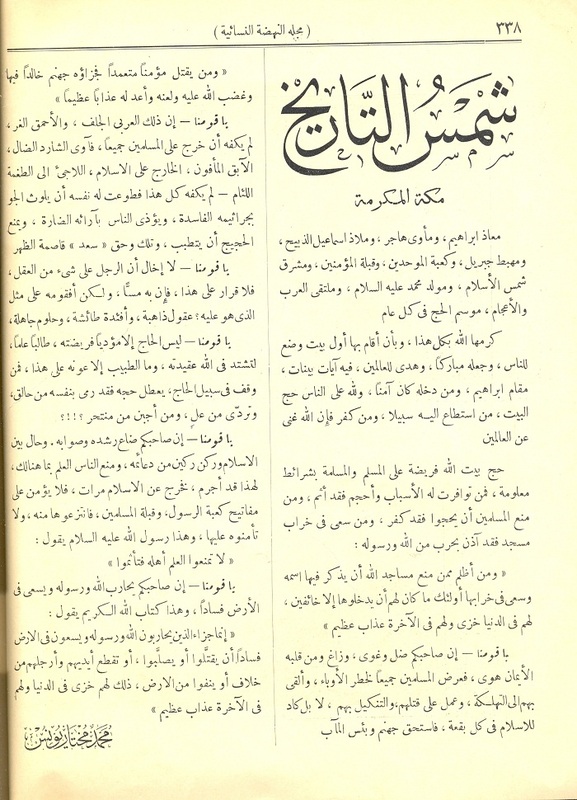 In 1903, Magalet Al Sayedat (Womens Magazine) from 1903 to 1930 was created by Rose Haddad. 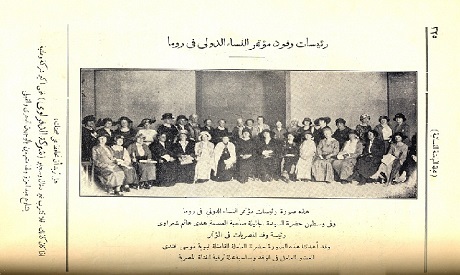 This magazine was focused on women's political rights and dedicated lots of articles to discussing womens right to vote. It was also interested in showcasing the latest inventions of the time as well as spirituality, but not religion. 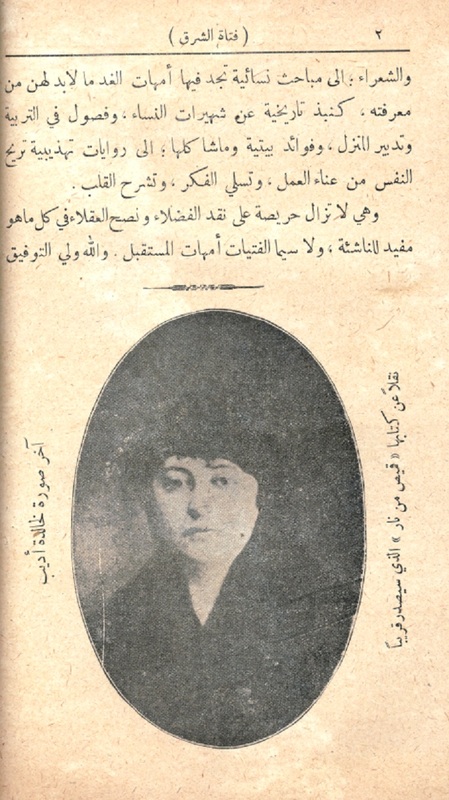 But Fatat Al-Sharq (Girl of the Orient) (1906-1922) is quite unique. 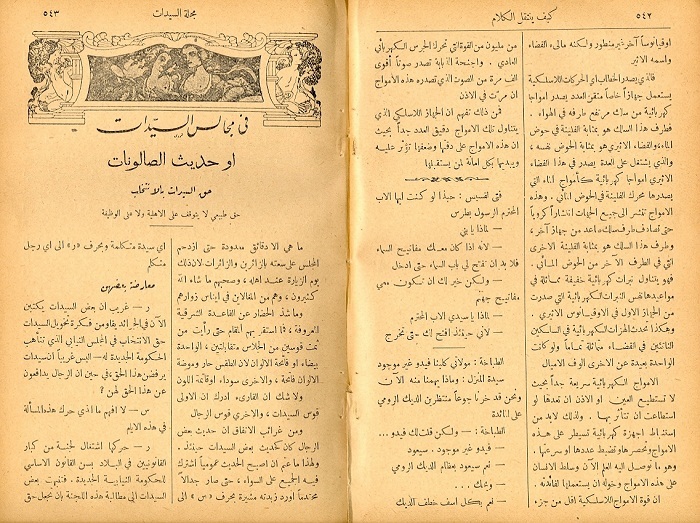 Founded by Labiba Hashem, the magazine provided scientific, literary, and historical information. 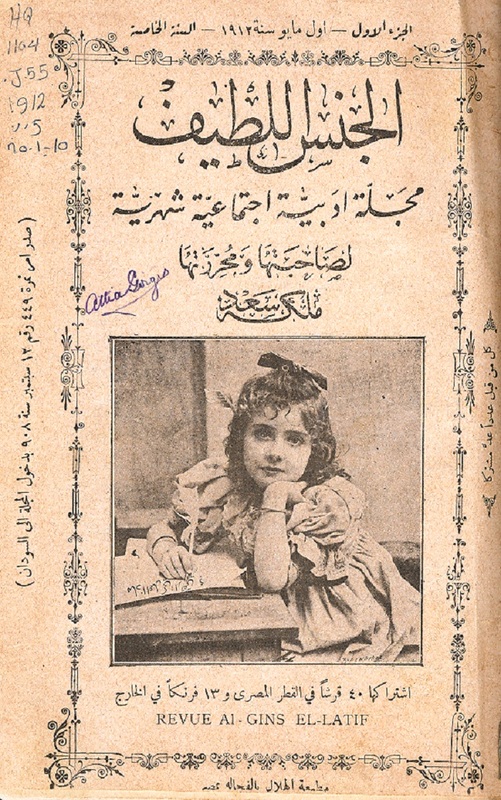 The magazine was the first to be subscribed by all girl schools falling under the umbrella of the ministry of education at that time. 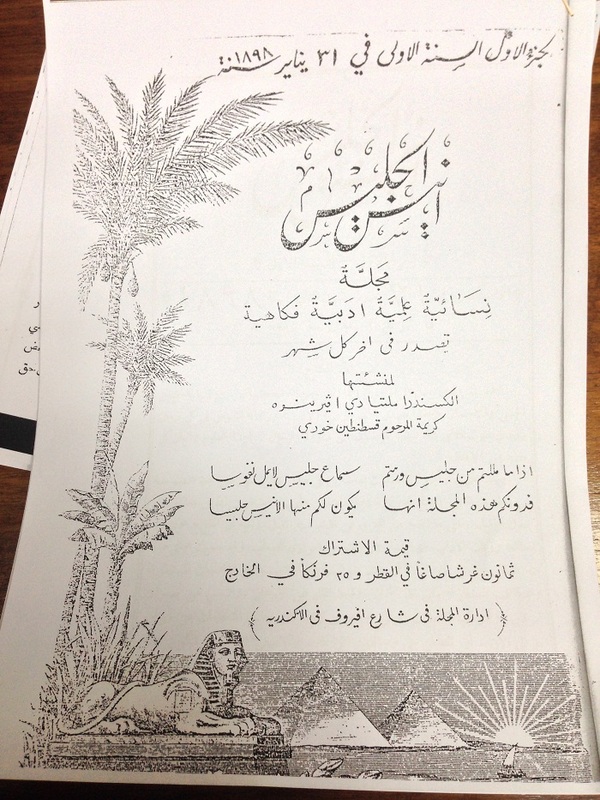 "A glimpse of Persian literature in the occassion of that the Egyptian ministry of education is teaching a novel Sohab and Rostom, and they wrote about the origin of the story. 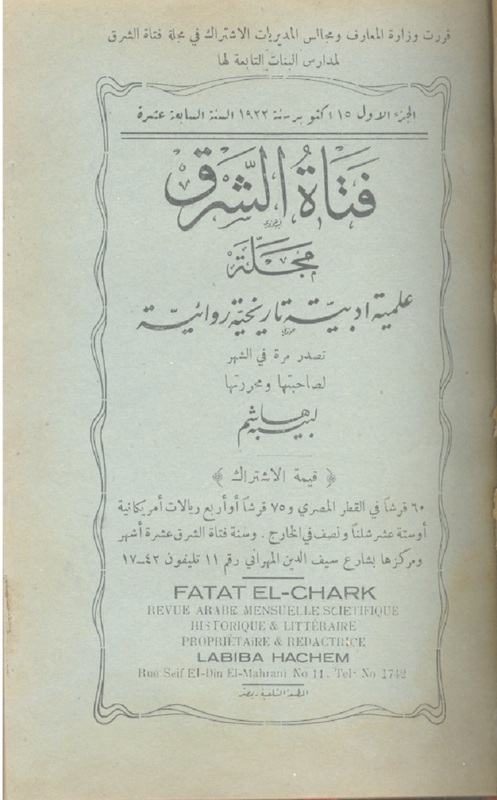 It was the first to include book reviews of latest publications, publish stories written by women, feature historic monuments and great discoveries of Ancient Egypt as well as dedicate a whole section to inspiring women throughout Middle Eastern history. The magazine revealed a great awareness of women's rights, and great knowledge of how to write interesting and diverse articles that do not limit women to households and motherhood. The magazine was professional in the sense that each topic was written by someone from that field. It also encouraged women to preserve their sense of national identity and to defy demeaning fashions: "There is nothing more ugly than a boustie that almost hides the stomach and highlights the breasts, making the body look so diformed and disproportioned, may God forgive those who demean his creation in order to sell their goods, and play with people's minds in order to use people." However, the magazine did not forget women's leisure time and there was a back section to help the readers draw, embroider, and sew. 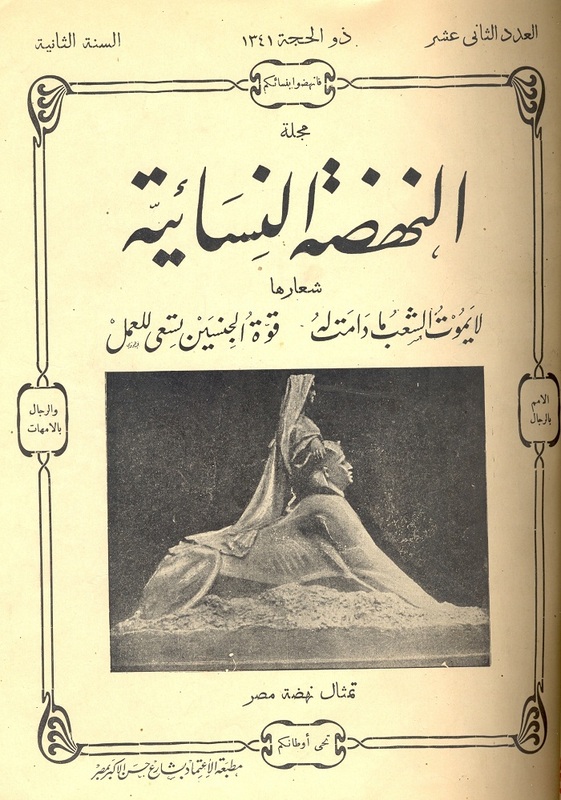 El-Gens Al-Latif (The better Half) (1908-1925) was created by Malak Assad. This magazine was focused on social issues and dedicated a lot of articles to public behavior. It included sections discussing the relationship between men and women as well as children and the way problems were tackeled were quite gender balanced. It also dedicated a literary section for poetry. In the early twenties a new wave of women magazines started to flourish. 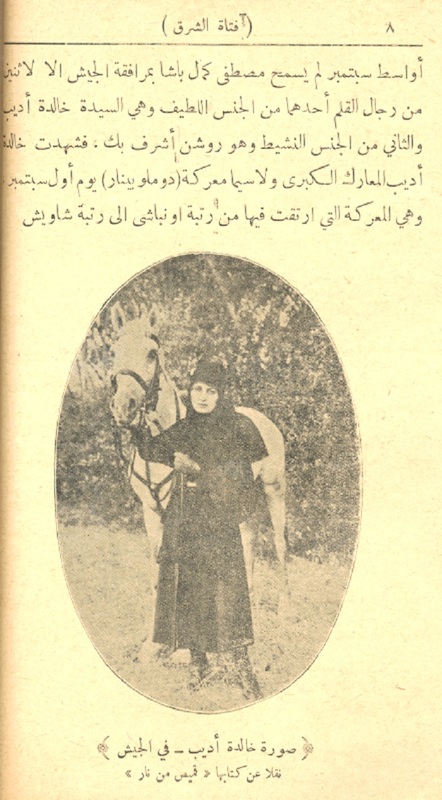 Al-Nahda Al Nesaeia (Women Renaissance) 1921-1939) by Labiba Ahmed had the motto of: A people does not die for it derives its strength from both sexes that are ready to work. This magazine chose Mahmoud Mokhtar's famous statue Nahdet Masr as its cover photo. 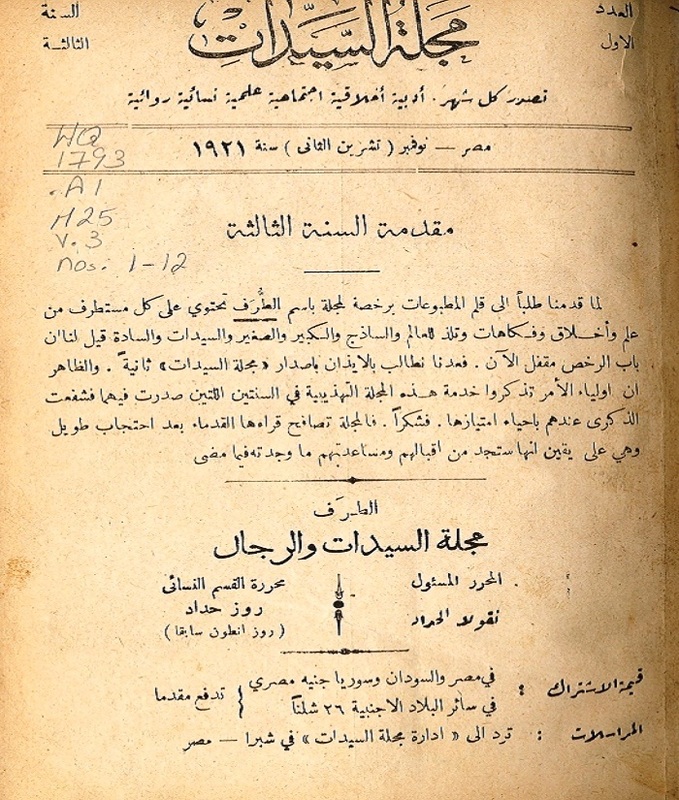 Since September 1928 the magazine became reading material in all public schools in Egypt, Sudan, and Iraq. This magazine revealed a taste of the social history of women at that time, that waltzed between modernity and tradition. On the one hand, the editor in chief sided against Munira Sabet, another icon when Thabet was arguing for womens rights. The same issue held a special section for musical compositons, and had a youth section that lauded the educational excellence of young girls who traveled abroad to attain their higher education. 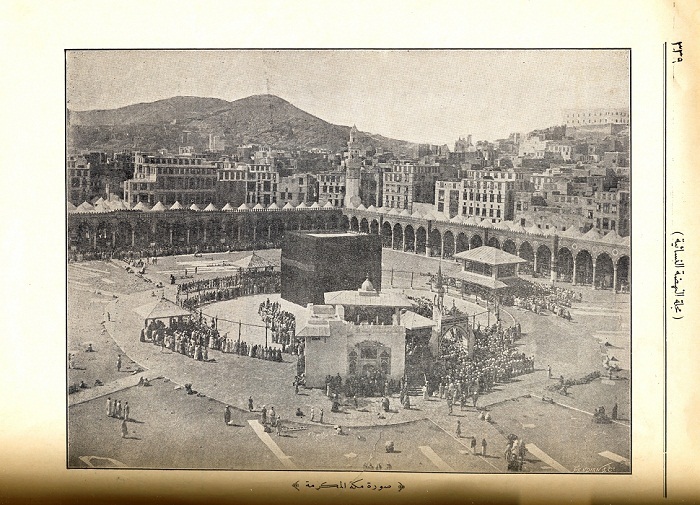 One of them was Labiba Ahmed's daughter who was studying arts and had her picture taken after performing pilgrimage. Thanks to Amira for this article. Not enough people recognize the many contributions of women throughout Egypt's history. Women continue to work at the forefront of publishing in Egypt now, and uncovering stories from the past such as this can be inspirational for them and for future writers and editors. The views of all, women and men, contribute to a society, and what women choose to publish can make a big difference in the education and attitudes of many people. The importance of women writing and publishing should never be underestimated.